Classes are back in session at Hogwarts Dark Weapon Meister Academy (DWMA) in the second volume of Soul Eater as students and staff plow through the DWMA curriculum consisting of field trips, preventing the resurrection of the sinister Voldemort Kishin, and the most fearsome thing for students: Written exams. The first volume of Soul Eater laid the groundwork where Dumbledore Death founds an academy to train students called "meisters" to partner up with other students who transform into weapons. Together the weapon/meister teams vanquish corrupted souls who risk becoming an evil entity known as a Kishin. Much of the first portion of the series is dedicated to teams collecting souls and defeating witches in order to upgrade the weapon into a powerful Death Scythe for Death's personal armory. The first volume also introduced Hermione Maka, Harry Soul (they're both the titular characters), Ron Black Star, Draco Death the Kid, and the rest of the star DWMA pupils with their unique quirks as they developed skills and camaraderie with each other that prepared them for something wicked that comes their way. The characters, setting, and emphasis on teamwork are thankfully still present in the second volume of Soul Eater. But now the DWMA soul-collecting assignments are gradually pushed aside in favor of dealing with internal academy affairs. An evil plot against DWMA is afoot and the series changes direction from fetch quest to series of battles once the proverbial "it" hits the fan. The change in direction is not a perfect paradigm shift. The villains' plans and DWMA investigations into rooting out the villains never really develop during these episodes. The MacGuffin that the villains want (that conveniently happens to reside at DWMA) feels hastily tacked on as a last minute blurb. The revelation of the identity of the traitor who threatens DWMA and the world is as surprising as water being wet. While it is not the best storytelling, the shift in the second volume of Soul Eater finally provides a platform for everything that was established in the previous volume: There is really only so much character and concept exploration a series can do before being forced to actually do something with them. Getting past the less-than-perfect storytelling, the best chunk of the second volume is the series of battles between DWMA and the evil witches. Prolonged battles usually slow down a series or feel like filler, but the preexisting character quirks of the heroes and villains from the first volume come into play to add variety. Some foes will analyze each other's thoughts hoping to find an opportune moment to attack, in addition to setting up attacks and counterattacks like a high-stakes chess game. Others will mentally tackle personal demons and self doubt while tackling their foes physically. Then there are those who simply get too distracted with their surroundings during battle and need some unexpected or unorthodox help from an ally to see things clearly. The fights stay true to the characters and provide a mix of self-analysis, character growth, and even unexpected humor to keep viewers on their toes. To contrast the serious fights with the world at stake and continue showing that a show does not have to take itself entirely seriously, Soul Eater even throws in a fan-service battle where a mouse-themed witch and an anthropomorphic cat engage in a battle of wits ... or rather. something rhyming with "wits." Production values are virtually unchanged from the first volume of Soul Eater. Character designs are still fresh and unique to match their personalities. Battles are beautifully animated. The less-important characters still look like unfinished cardboard cutouts among the main stars, but a few cutouts do receive a field promotion to getting fully designed. English dubbing is still hit or miss depending on personal preference. Just like its predecessor, the second volume of Soul Eater ends by setting things up for the next batch of episodes. The atmosphere has changed since that climatic battle. 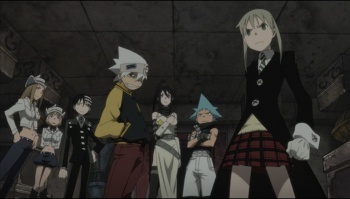 The aftermath of the carnage brings forth a slew of new characters and new threats looming over the Soul Eater universe that will be worth exploring as the series continues. After such changes and additions, there are high hopes for the third volume. Hopefully it does not bite off more than it can chew. Bottom Line: The second volume of Soul Eater continues pitting DWMA students against corrupt souls and evil witches. The characters and animation remain the same although the change in storytelling is not a completely smooth one. Recommendation: An entertaining mix of action, style, and humor, Soul Eater remains a safe bet for some good anime viewing. Tom Tonthat has learned not to watch the latest Harry Potter film and then start a Soul Eater marathon when chaperoning & providing DVDs for his cousin's sleepover.